If you’re concerned about how GDPR affects your website and digital marketing, then we can help! Don’t listen to the scaremongering about GDPR and fines – but don’t ignore GDPR either. We believe GDPR is good for marketing, for business and for consumers which is why we’ve heavily invested in helping businesses comply with GDPR as easily as possible. 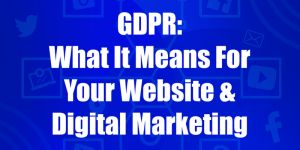 After many days spent reading documentation, talking to the ICO, JCP Solicitors, Cyber Security Experts and attending seminars, we’ve digested information and developed easy to understand information about how GDPR affects your website and digital marketing. Well, first we have an initial consultation, then a digital audit and undertake a PIA. At the end of the process, we provide you with the assurances and documentation you need to form part of your own GDPR documentation. The ICO want to see proof that you’ve taken reasonable steps to comply with GDPR and that you’re being responsible and holding yourself accountable under the new regulation. The cost is dependent on your own circumstances, your marketing activities and the size and context of the data you hold. We’ll be able to provide a quotation after the initial consultation. You may also like to attend one of our GDPR events, you can find them on Eventbrite. To arrange a free initial consultation, call us on 01792 29 33 66 or drop an e-mail to mail@copperbaycreative.co.uk. Please note: we do not offer legal advice on GDPR.